Sitting at a desk working on a computer all day can really stress your body physically. It can slow down the circulation of your blood depriving your muscles and organs of much needed oxygen. You can also feel a lot of muscle aches and stiffness in your wrists, hands, necks, and backs. Combine this with job tension or stress in your personal life, and you can spend a miserable day at work. There is help. Simple yoga asanas or postures can be done at your desk to stretch your muscles and spine, increase your circulation, and relieve your stress. As with more formal yoga practice in a studio or at home, you will need to start with your breath. This is the place where relaxation begins and all yoga practice must focus. An instant office refresher is the deep belly breath of yoga. As you inhale, expand your abdomen, letting your lungs fill completely. Hold for a second, and then slowly release your breath through your nose or mouth. With each breath, try to inhale and exhale at a slightly slower rate. You can also use movement such as the one that follows to help you concentrate on your breath. Begin with your hands palms together at your heart level. Your hands will look as if they are in prayer. Inhale. Extend your hands and arms in front of you as you exhale. Inhale by raising your hands and arms over your head. 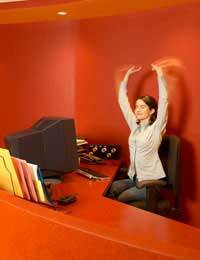 Separate your hands and move your arms to your sides while exhaling. Inhale and extend you arms behind your back. Lace your fingers together and raise them toward the back of your head while you exhale. Drop your hands and return to the prayer pose. Breathe deeply in and out. You may repeat the sequence if you wish. Stretching is essential for relaxation. Do gentle neck exercises first. Move your head to the right and then to the left. Look up and then look down. Move your shoulders up and down slowly. Cross your arms in front of you and then roll your shoulders back toward your spine. Once you have your neck and shoulder muscles stretched and relaxed, you can move on to the next asana. This is a variation on the Cat and Dog poses that are usually done on the floor. Sit in your chair and put your hands on your knees. Gently arch your back, then slump forward. Your elbows will alternately extend and slightly bend as you slump forward. What you are doing is moving your spine back and forth, thus reducing tension in your back muscles and realigning your vertebrae naturally. Another stretch you can do will stretch the sides of your body. Sit with your feet on the floor. Arch one arm over your head toward the other side of your body. Then, switch arms. For an additional twist on your spine, sit with your feet on the floor. Put your left leg across your right thigh, resting your left ankle just above your left knee. Put your left hand on the seat of your chair beside your buttocks. Grab your left knee with your right hand and slowly twist your body. These simple asanas can be done at your desk or even when you are travelling. They will help you stretch your muscles and relax your body.